• Panel with easy & clear legends to read. • Auto cut-off & output isolated. • Self sensing of contacts i.e. NO or NC. • Potential free start - stop signals. 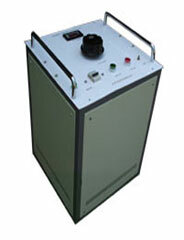 • Supply voltage : 230V AC +/- 10%,50 Hz. • Indications : Main ON, Output ON, Output OFF. • Operation : Contactor controlled push buttons for output ON/OFF.